What does a U.S. cabinet secretary, a U.S. Congressman, dozens of state legislators, hundreds of local elected officials, key business leaders, conservative talk-show hosts, columnists, bloggers and top community leaders have in common? They’ve all graduated from the Leadership Program of the Rockies (LPR). The program has been around for many years. The goal is to select 65 of Colorado’s most promising and aspiring leaders, bring them together and involve them in a 9-month intensive course on the basic elements of effective leadership – American style. From there, LPR leaders are expected to lead. We expect them to immerse themselves in worthy civic causes, community-improvement activities and politics. 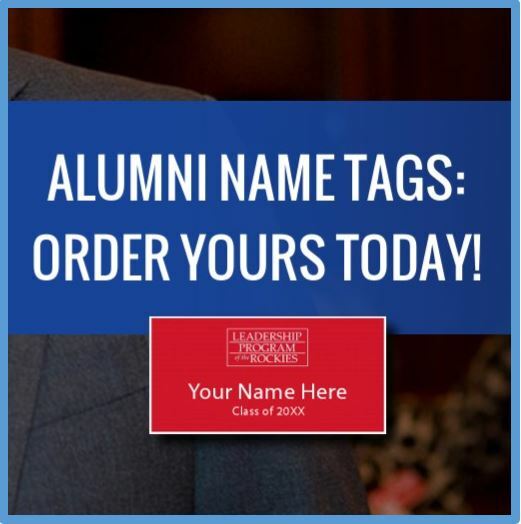 Not all LPR graduates run for office. In fact, the program isn’t really geared for that. But nearly all are involved at some way in the process of selecting political leaders at all levels. The Leadership Program of the Rockies is non-partisan. It is associated with no political party. Its orientation, however, is crystal clear. LPR’s philosophy is firmly rooted in the classical-liberal traditions of the American Revolution and America’s Founding Fathers. These traditions clearly align with the modern conservative movement. America’s libertarian mores are often evident, too. We stress the virtues of free-markets, Austrian-school economics, the elements of liberty stemming from Natural Law. We strive to fully understand why these principles inspired the Declaration of Independence and how they were woven into the U.S. Constitution. To graduate, one must make a cogent moral case for capitalism. Concepts like private-property rights, personal responsibility, legitimate rights versus entitlements and more are dissected and understood to a rather full extent. The class meets monthly in different locations around the Denver metro area. We fly in the nation’s best instructors and experts to lead lessons on the topics covered in each class. Sometimes the best experts are right here in Colorado. Their long-standing partnership with the program adds to its potency. We read from books like Ayn Rand’s Atlas Shrugged, Milton Freedman’s Free To Choose, original sources like the Federalist Papers, presidential speeches and similar works. The most valuable long-term aspect of the program is a growing alliance of like-minded leaders – all strong in their defense of liberty and their abilities in carrying the torch of freedom. LPR refines elemental leadership skills, too. Students learn how to communicate better. They hone debate skills, communication strategies, fundraising tactics, organizational skills and logic. Getting into the program is a competitive endeavor. Hundreds throughout Colorado apply every year. Only 65 are selected. Participation isn’t cheap. Though tuition covers a fraction of actual cost per student (the majority of the program’s resources come through various private donations), students are expected to invest in their own LPR training and education. Participating entails a true commitment to the program, to your classmates and to putting the program’s lessons to practical use after graduation. Scholarships are available for those deserve them. Those who complete the program find themselves acquainted with a new group of friends spread throughout Colorado and beyond. The LPR family is vast, influential, vigilant, active and brave. We all stay in touch through an efficient LPR communication network and through sponsored activities. Some are fun, such as picnics and social gatherings. Other gatherings are associated with a cause, a lesson, perhaps to gather with a noteworthy policy expert or public figure. Those are always fun, too. 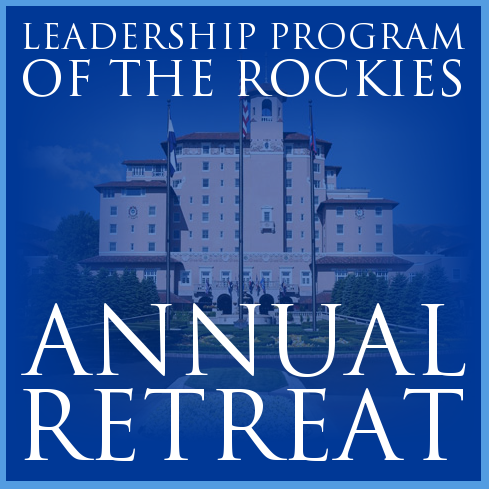 Each year, about late January and early February, the Leadership Program of the Rockies hosts its legendary annual retreat. The LPR retreat draws speakers and session panelists from throughout the country. If you enjoy watching national television news commentary and panel debates, if you enjoy talk radio, if you enjoy reading conservative columnists and authors, then you’ll recognized the kinds of people who show up at LPR retreats. The annual retreat is always open to the public. The event is an annual “who’s who” of capitalist leadership and political conservatism. Serious leaders in the West simply don’t miss the LPR retreat. The retreat is held at the spectacular Broadmoor Hotel in Colorado Springs complete with panel presentations, interaction with top officials, splendid dinner conversation and spellbinding lunch speakers. While the retreat is an opportunity for everyone in the LPR family to gather, being accepted into an LPR class is an exclusive and prestigious matter unlike any other. The brilliance of the Leadership Program of the Rockies is that it works very well. Students come from all walks of life. A successful candidate for enrollment will have demonstrated some capacity for leadership already. They will be able to share some vision they have for their personal ambitions toward noble civic leadership. They’ll have passion for a set of issues that motivate them. They’ll clearly express their love for America and their belief in the American exceptionalism. Their instincts will be in the direction of individual liberty, unalienable rights, courage and strength. Right now is the time for those interested in applying for the next LPR class to contact us. Applications are available online at the LPR website www.leadershipprogram.org. There you’ll find application materials, information about the annual LPR retreat at the Broadmoor, our Liberty Library and general information about the whole program. Maintaining the Republic entails intelligent, informed action from those who understand the principles of prosperity, who find agreement with the Founding Fathers and who are motivated to do the hard work of freedom. The Leadership Program of the Rockies is always looking for those who share these timeless values. It’s what we do to advance the holy cause of liberty. If you have sources that you recommend… Books, DVD, Podcasts, I would appreciate knowing about them.